RevK®'s rants: I need a keyboard that lights up! Shuttered 3D glasses cut light by a bit more than 50%. The monitor adjusts, but this means I can see little else in the room. The main light in the room would be a good idea but it does have some flicker, which is normally OK (unusual for me) but clashes badly with the 3D shutter glasses, so I have to play in the dark(ish). 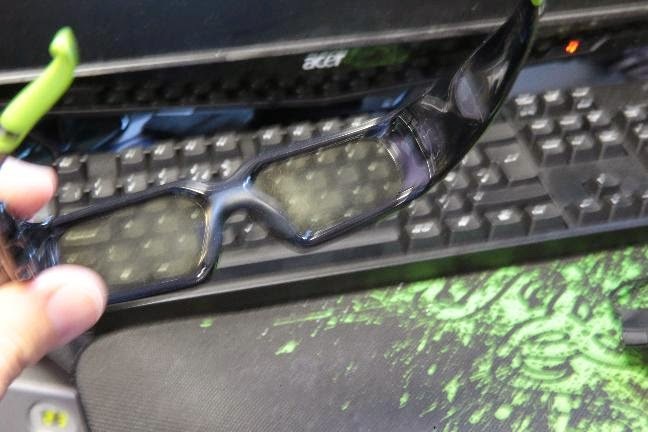 So I cannot see the keyboard, and whilst a lot of game play works fine with a 16 key grid on the razer mouse, when I need to press a key - even just to see a map, I struggle. Hitting the wrong key can be a problem in game! Using nice FILCO keyboard now, but need one that lights up with solid LED not strobed. That may be a challenge. I used to use the proper IBM model M keyboards that unicomp still make, but have been convinced to try these FILCO ones. They are OK and I am used to them now, though I miss my model M a bit. The model M did not light up either. Or, I suppose, I wait until I sort the new den and have a nice big TV with passive 3D so I can use with the lights on! Wait until VR headsets catch on... Having had a play on someones Oculus DK2 not being able to see anything else creates an interesting problem, I wonder if the final retail models will need a camera so you can see what's around as well. I can't use 3D shutter glasses, I can see the flicker caused by them illuminating only one eye at once. It drives me nuts. I appear to be very sensitive to flicker. LCD monitors with their "sample and hold" style of display have been a godsend for me. Back in the days of CRTs I was always running a higher refresh rate than everyone else in the office. By the time I was on 19" CRTs I was using 90Hz and above. Perceived flicker increases as the angle subtended at the eye increases, so as CRT monitors got bigger you needed higher refresh rates for the same perceived flicker. Phosphor persistence also tended to get lower over the years to satisfy gamers and animators who didn't want any blurring, but it made the flicker problem even worse. My first LCD monitor was such a relief. How about a simple halogen desk lamp pointing at the keyboard? Pro tip: Sort out your keybindings, then you won't need to look at the keyboard. You don't look when you're typing, do you? Gaming works just the same, once you say goodbye to the incredibly ill-conceived default keybindings in most games (WASD being the most prevalent symptom of this disease). Since you probably know how to touch-type, you already know where your hands are at home, and since the right hand will be (typically) on the mouse, you only have to deal with the left hand. The left index finger goes on the F key, the rest derives from that. So for movement you use ESDF in the familiar arrangement, and you put all your other keys in easy reach of that. In WoW, which I think is what you're referring to, you can achieve this with a number of action bar add-ons, back in my day "Dominos" was a good one. You set up two bars with six columns and two rows on top of each other and then edit the keybindings to match.